Keto taco cups with Fat Head pastry is another stroke of genius (if I don’t say so myself). I absolutely love taco’s but have given up on them since going low carb due to their high carb content and unhealthy oils they are fried in. My kids are over the moon I make these now. 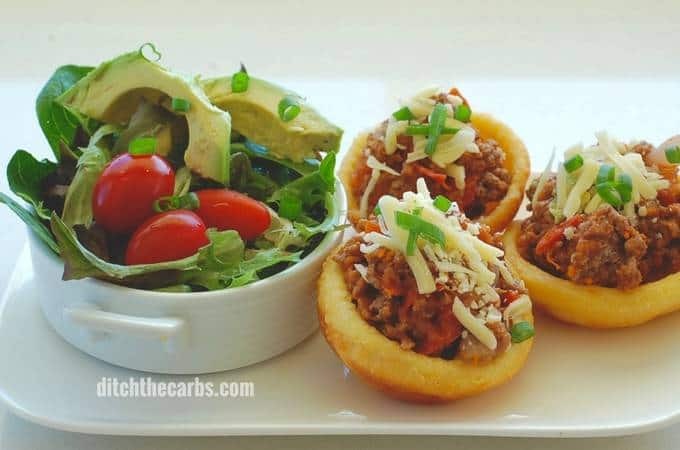 Keto taco cups with Fat Head pastry is simple, even though it appears to be a bit fiddly. Low carb, grain free keto taco heaven. If you are new here and don’t know about FatHead the movie, Tom Naughton or FatHead pizza, you are in for a real treat. Watch my new video to see how to make Fat Head pizza base. Fat Head pastry is the simplest and most divine tasting pastry that you need to learn when starting out low carb. With not much more than cheese, an egg and almond meal/flour, you can whip up this incredible pastry in a flash. You can make pizzas, crackers, nachos and now taco cups. Many tell me they now prefer Fat Head pastry to the real deal. And it has managed to turn the most ardent high-carb lover around to our low-carb lifestyle. I pay homage to Tom Naughton in this post and this one. Tom may or may not have invented this recipe, but he certainly gave his name to this iconic low-carb pastry. I encourage you to watch his videos and read his blog, he is a superb, quick witted comedian and former health writer. Fat Head pastry really is the Holy Grail of low-carb pizza. If you haven’t made it yet, you’ll understand what I mean when you do. 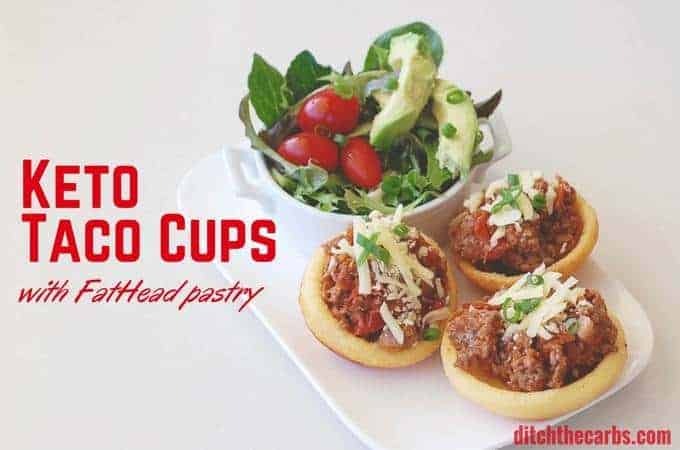 Keto taco cups with Fat Head pastry are super popular with children and adults alike. Make them as mild or spicy as you like. 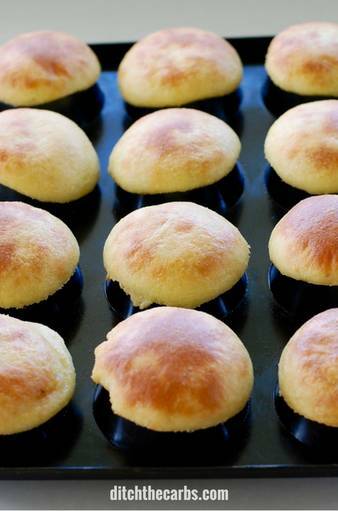 See the conversion below to see how to make these using almond flour or coconut flour. Gently fry the diced onion in oil until clear then add the meat, breaking it up into tiny pieces as it cooks and browns. This should take up to 5 minutes. Add the spices and tinned/canned tomato and tomato paste. Stir then simmer on a low heat for 15 minutes (uncovered to thicken the meat sauce) whilst you make the Fat Head taco cups and side salad. Mix the shredded/grated cheese and almond flour/meal in a microwaveable bowl. 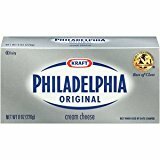 Add the cream cheese. Microwave on HIGH for 1 minute. Stir then microwave on HIGH for another 30 seconds. Remove and stir again. Add the egg, salt, and spices. Mix. Place the Fat Head pastry between 2 pieces of baking parchment/paper and roll into a thin, rectangle (see photos here). Remove the top baking paper/parchment. 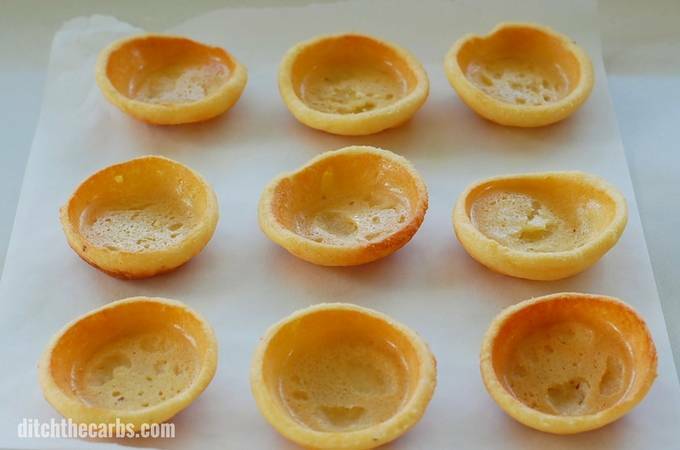 Cut the Fat Head pastry into circles using a cookie cutter or a glass tumbler (I managed to make 15 taco cups). 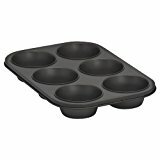 Place each one on an upside down, oiled, muffin tray OR individual silicon muffin cases. Then bake at 220C/425F for 12-15 minutes, or until browned on the top. Remove each taco cup, place on a baking tray lined with baking parchment/paper and bake again for 2 minutes to allow the inside to brown and crisp slightly. Place the keto Taco Cups on a serving plate and load up with the keto meat mix. Add cheese, salsa, guacamole and cheese. Reheat if you like the cheese melted. Serve with sour cream and a green side salad with plenty of oil or dressing. Fat Head pastry can also be made by replacing the almond meal/flour with 1/4 cup (4 tbsp) coconut flour. Nutrition notes were calculated using the Fat Head Taco Cups and the keto meat sauce divided equally between 5 servings. Additional toppings are extra, because what and how much you use will be completely different for everyone. 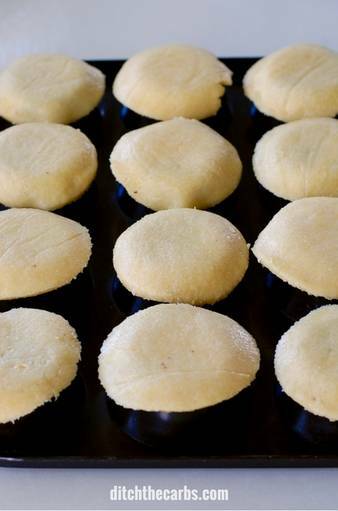 Place each Fat Head circle of pastry on an oiled muffin tray or silicon muffin case. Keto taco cups with Fat Head pastry are lovely served with a green side salad, avocados, guacamole, cheese and sour cream. Even a drizzle of lime juice over it all would be amazing. 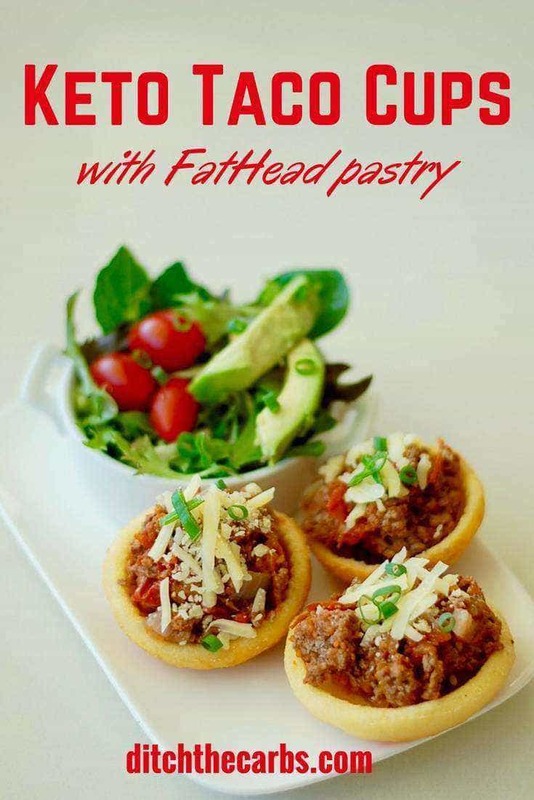 How do you use Fat Head pastry? Leave me a comment and you might just see your idea on the website soon. 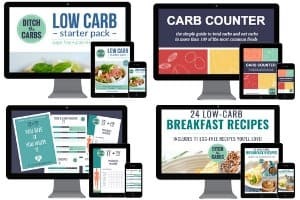 Pin for later, follow me on Pinterest and start a few low-carb boards for dinner inspirations. Just made a batch, they were terrific. Next time I’ll cut the pastry into triangles and use as corn chips for my nachos. Just made a batch, they were fabulous. Next time I’ll cut the pastry into triangles, and use them as corn chips with Nachos. why mozarella? can i use cheddar? Mozzarella is preferred as it is stretchy and behaves more lie a pizza dough. You may use cheddar, however the crust will change and be more crispy. What is the nutritional info for the taco cups only? The taco cups are made using Fat Head pastry. You can look at my Fat Head crackers recipe to see the nutritional value of the Fat Head pastry alone. These taste incredible and boy do they look impressive! And the fact that they are actually so easy to make is a bonus. I absolutely love Fathead, so many creations from one simple dough recipe! A huge hit with my hubby and granddaughters. I only cooked for 10 minutes after first batch cos they were over done. Want to show you a picture but don’t know how. 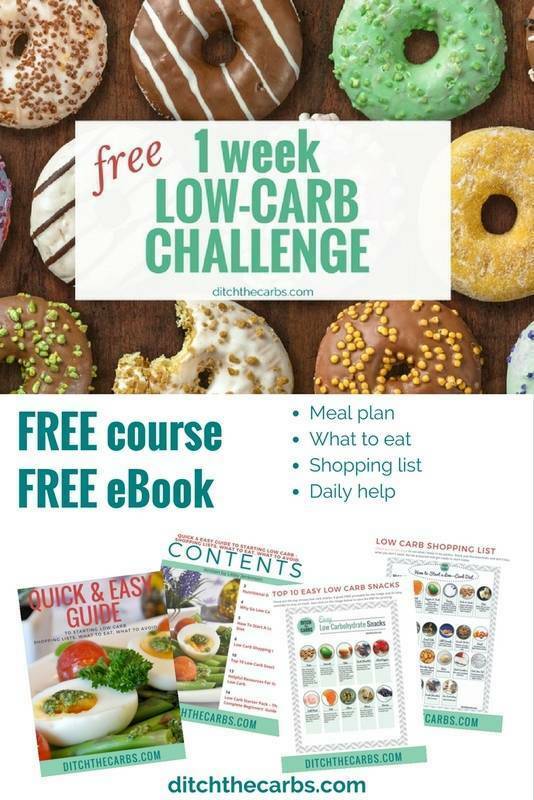 You can always upload a photo to my Low Carb Support Group or Facebook page. There isn’t an easy way yo upload damages to my website for readers. I’m so glad you loved them. How thin should the dough be? What size should the circles be? I made this and my dough was too thin and the circles too large. My cups had holes all over them and some were overdone. I used a large coffee mug to cut the circles then rolled them out until large eneough to cover the upside muffin tin, but thick enough to be sturdy when baked. How do you prevent this from sticking to the parchment paper when rolling out and then trying to remove from parchment paper??? It has to be baking parchment, the oil from the cheese will be enough to stop it from sticking. Also use wet/damp hands if it does pull a little from the paper. Beautiful recipes, thank you. I would like to know can the ups be made ahead and frozen for future use. Thank you.. I have never frozen these but I imagine they would freeze nicely. Just pop them back in the oven to crisp them up again once defrosted. I’m playing around with creating a LCHF pie recipe and given the Fathead pastry is so versatile, I was thinking of using it as the top part of the pie crust. I have a good pie crust for the bottom and sides but it won’t work for the top as it’s not sturdy enough. Do you think Fathead pastry would work? Yes, Fat Head as a party crust would be amazing. I have a few new Fat Head recipes coming up, so watch out. Is the carb count for one taco cup or all five servings? 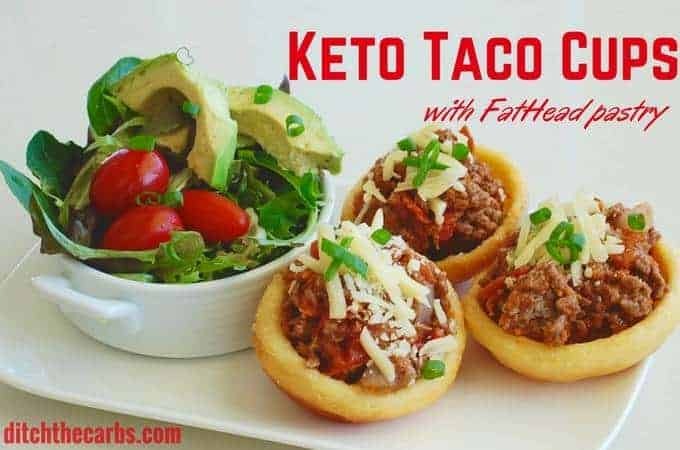 The nutrition states “Nutrition notes were calculated using the Fat Head Taco Cups and the keto meat sauce divided equally between 5 servings”. So the nutrition is 1/5 of all the taco cups (I made 15 and served everyone 3 each) and it also includes 1/5 of the taco meat mixture. My daughter added some sweetener and vanilla, then rolled it flat and added cream cheese and blueberries. Cut small slits in the dough, then braid and bake 12 minutes. It was awesome! I did the same, but added pineapple, cherries and roasted pecans. You can use any fruit or nut.